The Gowanus Lounge: Will Gowanus' "Public Place" Be Sent to Detox? 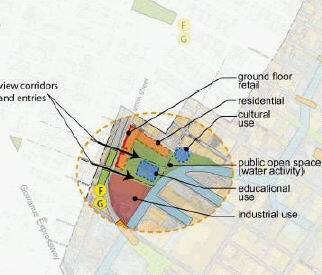 Will Gowanus' "Public Place" Be Sent to Detox? One of the more interesting places that figures in Gowanus redevelopment ideas is the site called "Public Place." It is a vacant parcel between the Canal, Fifth Street, the Smith-9th Street Station and Smith Street that was once the site of a manufactured gas plant owned by the corporate ancestor of Keyspan. It is also one of the most toxic parcels in all of Gowanus. The Public Place site, including the adjacent warehouse to the south, offers the greatest potential due to its size, ownership and frontage along the canal. The controlling determinant is current contamination and the extent of clean up required (cost and time being critical issues). The best use of this area is shown...recommending residential uses, retail along Smith Street frontage, plus extensive open space and access to and along the canal. Former manufactured gas plants in Gowanus (there were three) and around Brooklyn left behind a dangerous toxic soup that includes cyanide, but state environmental officials told Community Board 6 this week that the Public Place site can be cleaned up and "support virtually any development." Not all of the toxins will be removed from the site. Instead, barriers will be put in place to minimize health risks. The cleanup will take less time or longer depending on how the parcel--which is publicly-owned--is developed. One of the major pollutants on the site is coal tar, which has been found to depth of 135 feet. Coal tar gas, meanwhile, is said to have spread far beyond the site. Pollutants from the site continue to enter the Gowanus Canal. Gowanus #1: What's the Plan?